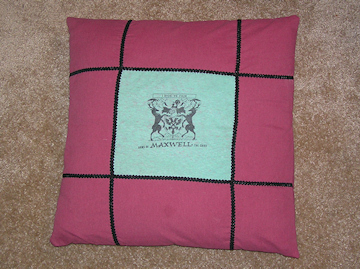 This pillow was created from a worn out family-reunion logo t-shirt. 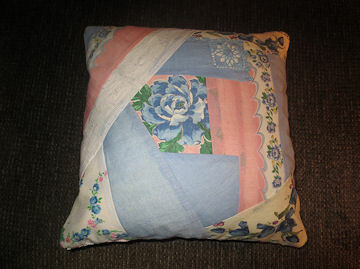 Comfortable bedsheets were used as the pillow border. Grandson Maxwell never knew his Grandmom. 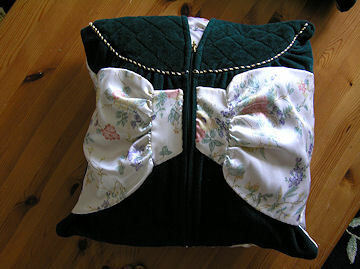 But many stories of her will be told while snuggling with this keepsake pillow. 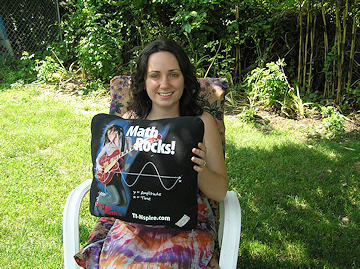 This college graduation gift created from a Texas Instruments® logo t-shirt was well received. 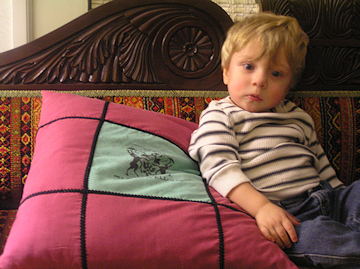 "I really love my pillow. I really love it!" 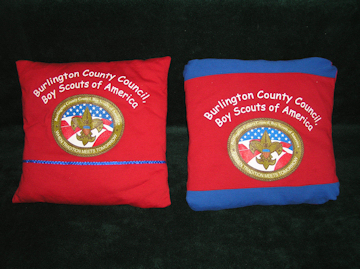 Boy Scout Farm Fair t-shirts are now handsome keepsake pillows for the Boy Scout office. 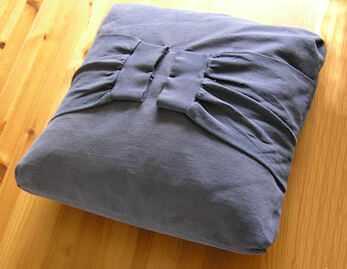 Long sleeved shirts, robes, or dresses make a comforting Sleeved Memory Pillow. 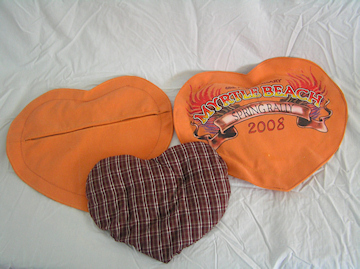 Heart shaped, microwavable, grain-filled Warming Pillows. 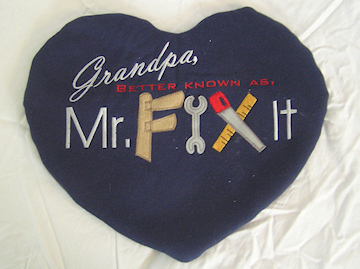 Grandpa's long sleeved shirt became the inner, grain-filled piece. 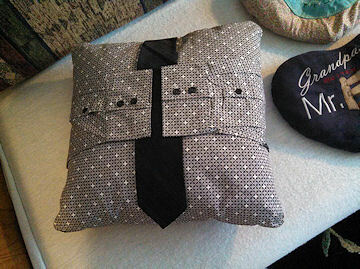 The outer cover was his beloved biker shirt. A sweatshirt has new life as a grain-filled warming pillow. Someone is always borrowing it from off Dad's bed! 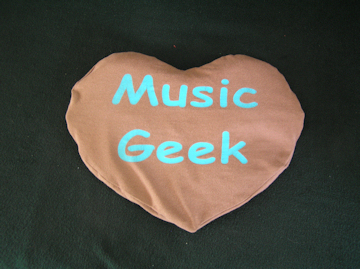 Question: "Can you make my High School Choir shirt into a Warming Pillow?" Answer: "Yes, and here it is!" "Mom embroidered this dish towl as a wedding gift. 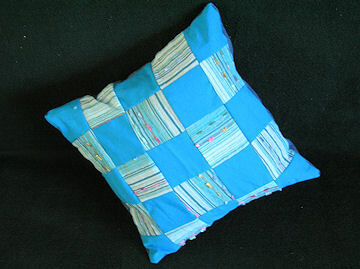 It became a Lavender Scented pillow that warms both the body and heart." 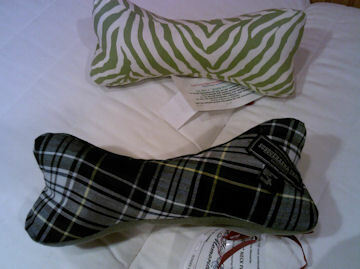 These pillows have zippered outer pillow and removable grain-filled inner pillow. Ingredients: Long or medium grain rice, herbs or essential oils. 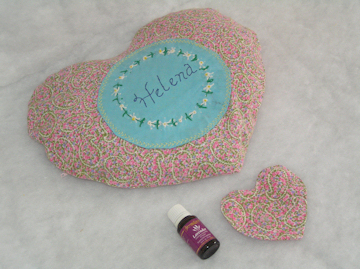 Choose Rosemary, Peppermint, Cloves or Lavender Essential Oil. We use Young Living and DoTerra Essential Oils.